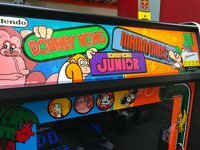 Donkey Kong arcade game is considered as one of the most popular and most controversial retro arcade games ever developed in the industry. This classic video game which features three of our beloved gaming icons - Mario, Lady Pauline, and Donkey Kong - was released in 1981. But before it became an instant hit among arcade gamers, Donkey Kong had to endure several developments and issues through time. This game was developed by Shigeru Miyamoto who worked for Nintendo way back in the 80s. Originally, he was tasked to produce a game patterned after Popeye - a prominent cartoon character back then. But since the gaming company had yet to secure the necessary licenses to use his character, Miyamoto had to revise his plan and create new characters. This was when Mario, Pauline, and Donkey Kong were introduced. The character of Mario was initially called Jumpman for obvious reasons - he jumps on almost everything. On the other hand, Donkey Kong's name was derived from the word "donkey" which denotes stupidity in some Japanese and English dictionaries; and from the blockbuster hit King Kong. Whereas, Pauline's name was also given to honor one of developer's wife, Polly. Pauline is said to have a resemblance to Princess Peach of the Mario Brothers franchise. It was believed that the theme of Donkey Kong arcade game was patterned after the bizarre love triangle story of Popeye, Olive, and Bluto. This game was also the debut of Mario in the gaming world. Donkey Kong's unique and immersive gameplay sets it apart from other retro arcade games such as Pac-man. Players control Mario as he ventures from different platforms and levels to rescue the kidnapped Lady Pauline. 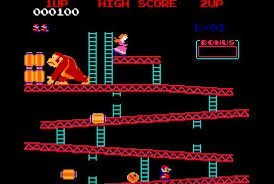 He needs to successfully climb the topmost platform to save the lady from Donkey Kong who unleashes a barrage of offensives to stop him. Players need to avoid wooden barrels, beams, springs, fireballs, and fire foxes by controlling Mario to either jump over it or climb on available ladders. They can also see bonus items and power-ups along the way which can help them earn more points and destroy these obstacles. They need to reach the Lady Pauline - who is on the highest level - alive and before the time rounds out to advance to the next round. As mentioned, there are in-game items which can reward players with extra points and power-ups. These include Lady Pauline's hat, purse, and parasol. These symbols appear anywhere on the game screen in every round. Players need to collect these items as it will grant them with bonus points ranging from 300, 500, or 800 points. Aside from just jumping over obstacles, Mario is also given a special attack feature through the form of a hammer. This special item allows Mario to terminate all oncoming obstacles except Donkey Kong. However, players should be aware that there is only a limited number of hammer icons distributed in the game. They can't also use the jump button during this feature. Players can also get bonus points from the remaining time after each round. They can also get extra lives every time they have accumulated 20,000 points in the game. Many of these features have been adopted by arcade casino games for hugely entertaining ways to win cash. The exceptional gaming feature of Donkey Kong brings its players with exciting and immersive rounds per level. This classic arcade game has 4 varying game boards which are randomly played in every stage. The difficulty of these game boards also increases as the player progresses in the game. This features the usual girders which are common in all game levels of Donkey Kong. In this game board, Donkey Kong randomly throws and rolls wooden barrels towards Mario. Players need to avoid these barrels by jumping over it or using the special hammers found in this stage. Mario can also climb up and down ladders in this board. Again, players need to reach the topmost level to rescue Lady Pauline - who will eventually be taken away again by Donkey Kong. This board level is mechanically unique since it involves automatic lifts to assist Mario. Players should expect the first set of Pauline's items here which will reward them with bonus points. They should also be aware of the new sets of enemies here -two fireballs and the bouncing springs. There are no hammers available in this game board, so players should maximize the jumping capability of Mario. It is also a challenge for players to use the elevators in this game board. They need to time their jump every time they get in or get off the elevators since these are automatic machines. They should also be aware of the possibility of getting crushed on board the elevators if it reaches to the top. However, once Mario is about to reach Lady Pauline, Donkey Kong snatches her again and brings her to the next game board. In the Pie Factory, Mario is greeted with random pies falling from conveyor belts above him. He needs to avoid these pies, together with the flaming elements roaming around the screen. Players can use the special hammer found in this level to reach Pauline. But just like in any other game board, Donkey Kong takes Pauline again before Mario could even reach her. This is the final game board in this arcade game. The Long Fall level features Lady Pauline in the topmost platform - with Donkey Kong just beneath her. Players need to remove the yellow blocks found in the structure for it to topple and to rescue the Lady. They also need to be careful with the fireballs roaming around the structure. Once all yellow bricks are removed, the building will collapse together with Donkey Kong, and Pauline will be rescued finally. Donkey Kong arcade game then restarts back to the first game board. Players can also earn more points - and even lives - with the Kill Screen bonus stage. They just need to grab rewards and bonuses, so they can to accumulate enough points to gain extra lives. This bonus level is also timed.